New Year, New Decade, New Possibilities!! Welcome Week Thirty One and Welcome Back!!! Well I'm BACK and I sooooooo excited about the opportunity to create new works of wearable art for all to enjoy! This new year is full of new possibilities and new things to learn and I can't wait so start creating and learning. I have been looking into a variety of workshops and classes that will help me to develop some of the new concepts that I have in mind to add a new dimension to my designs. This year I really want to "push the envelope" when it comes to my designs. I love the thought of combining many techniques and mediums to create that special "one of a kind" piece of jewelry that really is a true "mixed media" creation. This soldering class and the ones I have signed up for for the next 3 months will hopefully put me on the path to creative freedom!!!! These samples are just the beginning. 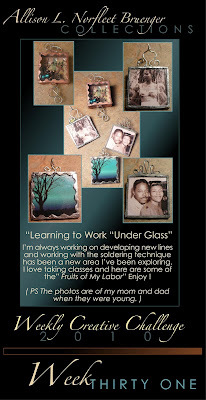 I love these pieces because I got to use my father's photography. Plus I love these photos of my mom and dad. Enjoy ! Take care and keep creating in 2010!!!!!!!! Hi Allison!! I just had to check out your blog!! I love your art! Thanks for sharing your talent with those of us who are new on this journey!! !